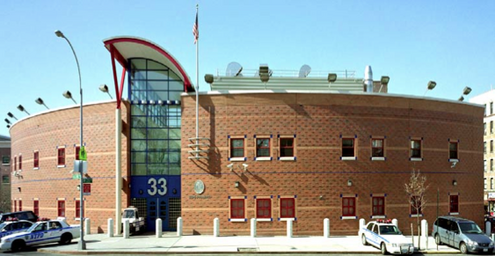 The New York City Department of Design and Construction (“DDC”) retained PMS Construction Management Corp. (“PMS”) as the construction manager for the construction of the new 33rd Police Precinct Station House for the New York City Police Department (“NYPD”). The new precinct is located in the Washington Heights section of Manhattan. During the pre-construction stage of the project, PMS worked closely with the Architect to achieve a building design based upon the then state of the art strategies for sustainable site development, energy efficiency and environmental quality. PMS and Dattner Architects (“Dattner”) were committed to building a facility that would have the least amount of detrimental impacts to the environment. 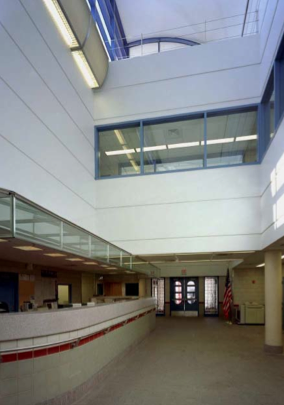 During the construction phase PMS was responsible for the directing, coordinating, inspecting, monitoring, and the expediting of construction in accordance with the design prepared by Dattner, a design and scope of construction expanded with the addition of another floor to the building. When contaminated soil and groundwater were found throughout the site, PMS managed and coordinated the environmental cleanup of the site. The new 33rd Police Precinct Station House stands as an example of success and accomplishment due to the collaboration and efforts of project participants. It incorporates new and innovative design concepts. The building serves as a welcome and accessible addition to the community.